002018 is a Responsive Joomla! template based on the Bootstrap Framework. The Bootstrap Framework makes it fully responsive to all screen resolutions and aspect ratios. Moreover, thus it carries a lot of useful features, for instance additional HTML elements, set of CSS components, grid system and much more. Design is the obvious part of your future project, and our Joomla! 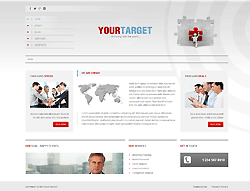 template offers you the very concept you need to become noticeable in the online world. This ready-made solution can ideally suit your business purposes, and it will certainly help you present them in the most attractive and memorable way.